Joshua Wilgoren was arrested Friday on Massachusetts OUI Charges after allegedly crashing into a Minuteman statue in Framingham. He was charged with Operating Under the Influence of Alcohol. 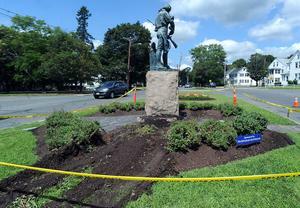 According to the Framingham Police Department, Wilgoren lost control of his vehicle and struck the statue, which is reportedly 106 years old and one of only three Minuteman statues in Massachusetts. The other two Minuteman statues are located in Concord and Lexington; and interestingly, after the Framingham statue was made, the Massachusetts Legislature passed a law banning any further from being made. Although there is no indication whether Joshua Wilgoren submitted to any Field Sobriety Tests or an Alcohol Breath Test, Framingham Police he allegedly admitted to having had a few too many to drink – if you believe that. Following his arraignment on DUI / OUI Charges in Framingham District Court, Wilgoren was released on his own personal recognizance. Boston DUI Lawyer Lefteris K. Travayiakis is available 24/7 for consultation on all Massachusetts OUI / DUI Charges, including Operating Under the Influence of Alcohol or Drugs.